However small your plot, there’s always room to go up and arches are my favourite type of feature to effect an amazing transformation in very little time. 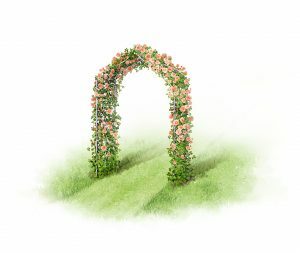 Even better, this type of project is perfect to achieve in a weekend – indeed the simplest arches only take a couple of hours to put up and plant. 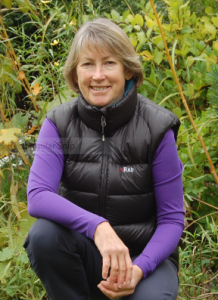 Then you’ll be able to sit back and enjoy the results that will enhance your garden for years to come. Earlier this year the lovely folk at Husqvarna commissioned me to write a piece for their website illustrated with gorgeous, specially drawn artworks by Irene Laschi, which appear in this post with their kind permission. The original feature and lots more information can be found here. I love all the illustrations but the ‘Flower Wheel’ illustration at the end of the feature (not shown on this page) is enchantingly beautiful. 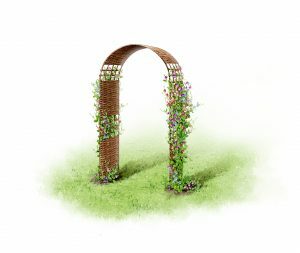 Arches are super-versatile, bringing vertical structure and style to almost site around the garden. 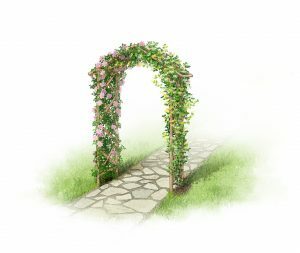 Use an arch to mark the transition from one area to another; as a little arbour with a bench beneath to create dappled shade and privacy; to frame a decorative feature like a sculpture; or over a gateway to make a welcoming entrance. Alongside a house, wall or fence, the cleverly-designed one-sided ‘wall arch’ is perfect, while if you don’t have any soil at all, the solution is an arch supported by integral planters. Take a tip from city planners and when there’s no room to go outwards, go up! 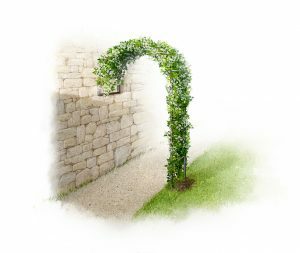 Even the smallest space can be transformed with a vertical feature, and this clever design of wall arch can be fixed to a building, wall or fence on one side. Wreathed in flowers and foliage, these arches turn bare, bleak spots into enchanting places to walk through, or linger to enjoy the dappled shade and privacy. 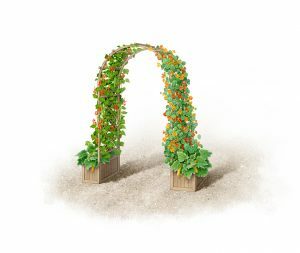 The perfect solution to creating height, structure, and much more planting space where there’s simply no soil at all. Close to the home, why not grow a combination of delicious vegetables and vibrant edible flowers that provide a feast for the eye and the table, all conveniently handy for the kitchen or barbecue. Enchantingly pretty arches, hand-made from woven willow and hazel, make an instant transformation even without any plants and only take a few minutes to put up, too. Match the old-fashioned look with plants to suit: beautifully fragrant sweet peas or a similar dainty, lightweight climber. Wood lends itself to a huge range of styles, including some stunning contemporary designs. As well as matching the style of arch to your home, ensure the ultimate in good looks by choosing a size in keeping with your garden: wide or long arches look best in plenty of space. 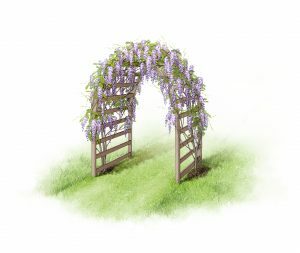 Bold climbers with an architectural habit really complement this style of arch, like wisteria which has big leaves and huge, dangling racemes of fragrant flowers. Elegant, shapely yet strong, metal arches come in a wide choice of sizes and styles to suit almost any garden. Designs with an open framework are particular good for growing roses as the thorny stems can be easily trained and tied into place, while those with lattice sides are perfect for climbers with a scrambling habit, like clematis – the aptly named ‘queen of climbers’. Create a colourful and enticing entrance by combining an arch with a little gate. Then, make the welcome even more special with flowers that are fragrant as well as beautiful. Scented climbers like honeysuckle, jasmine and roses are truly delightful on arches as the blooms are just at the right height for their perfume to be enjoyed to the full.